Filed to: But Why?Filed to: But Why? What these companies want to ruin. The Arctic National Wildlife Refuge (ANWR) is no longer safe. Two Alaska Native corporations and an oil services form have jointly applied to begin seismic testing on the refuge’s pristine 1.5 million-acre coastal plain—the calving grounds of the Porcupine caribou herd, which the nearby Gwich’in First Nation relies on for food security and culture. This development is according to a permit application The Washington Post obtained and published Thursday. The Post even got its hands on the Fish and Wildlife Service’s (FWS) response to the application, which said the plan was “not adequate” because it failed to include studies on how tests would impact wildlife and environment. The permit application requests to begin exploration this winter, with two 150-person teams arriving to the land even the Gwich’in don’t visit out of respect for it. But the push to extract oil from ANWR is moving fast: In April, the Bureau of Land Management, under which the FWS sits, opened a public comment period to help prepare the Environmental Impact Statement for any potential drilling. The bureau gave no indication then that companies could begin applying so soon for seismic testing, a process to find oil and gas deposits that sends sound waves underground. 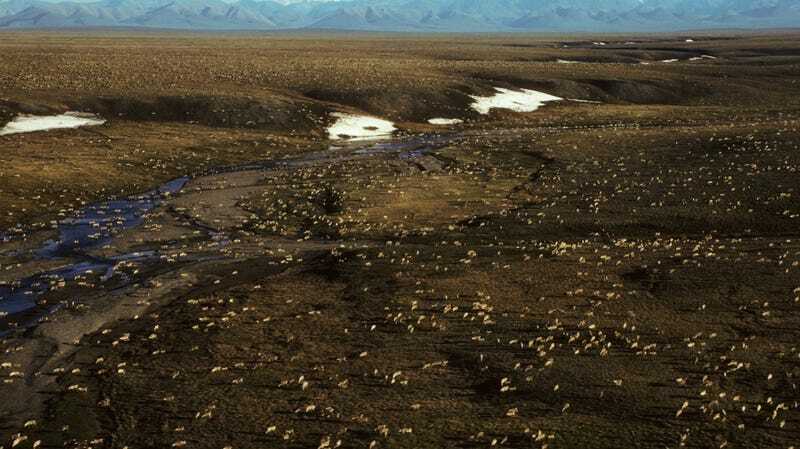 Seismic testing requires large crews, and the trails from the crews that conducted similar seismic testing on the ANWR’s coastal plain back in the ’80s still mark the terrain. The proposed exploration would also cover a much vaster area than drilling supporters had let on. The companies applying for testing permits argue that they’ve come together to help minimize any environmental damage. They plan to use sleds, smaller vehicles, and biodegradable lubricants, as well as build ice roads, per The Post. They’ll also be using explosives and airstrips to get the job done. The Alaska Native corporations—Arctic Slope Regional Corporation and Kaktovik Iñupiat Corporation—don’t represent Gwich’in people, but they have stakeholders in the Native village of Kaktovik. This community supported oil and gas activity in 2005, but in February, the mayor issued a resolution urging Congress to prevent drilling in the ANWR. Dementieff has faith Alaska Native tribes throughout the region will come together to stop this extraction. She didn’t know about this application until I called her this morning, and she was in disbelief when she heard. “That is completely insane and disrespectful,” she said. She emphasized that the fight to keep oil and gas interests out of ANWR isn’t over.